The FSGW weekly English Country Dance offers delightful dancing, led by talented callers, accompanied by top-notch musicians playing a wide variety of instruments. The crowd is friendly, and new dancers are always welcome. You don't need to bring a partner, or dress up. 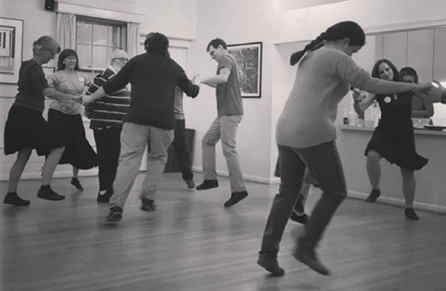 We dance in the upstairs community room of the Glen Echo Town Hall, which has a springy wood floor and is air-conditioned for dancing comfort in hot weather. Some dancers are sensitive to fragrances, and they are grateful when you skip the perfume and scented after-shave. Every year in May, usually on the 2nd Saturday, we hold a dress-up ball. Link to Washington Spring Ball information. When: Wednesday from 8:00 - 10:30 p.m.
We dance every Wednesday throughout the year, unless that day is a major holiday. However, note we only post our schedule of upcoming dances for the next 1 to 2 months. Please consider adding a donation of any amount to support students and those with limited income, and to increase payments for performers. Questions? Email English Country Dance or call Anna Rain at 240-645-8482.